Every single coin donated to your cause makes an important difference. We know it’s critical that GalaBid’s digital platform enables you to get the most from your fundraising efforts. We work hard to make sure our services lead the market in terms of mobile digital fundraising. Our technology has to meet user expectations and deliver great returns to event organisers. It’s why we’re constantly reviewing our offering to ensure you always have the best fundraising platform in the palm of your hand. And it’s why we’re thrilled to tell you more about our all NEW platform. After 12 months’ development work, GalaBid’s new mobile fundraising platform is ready to help your cause GO FURTHER. Clients asked for an even more beautiful platform that would offer outstanding user experience, create healthy bid competition and raise more for their great causes. In response, we believe we’ve produced the industry’s best digital fundraising platform. Our new digital fundraising platform is designed to give you more creative control over your fundraising. We’ve introduced flexible design that supports custom branding and layout so your auction is as unique as your cause. The new design is clean, eye-catching and beautiful to look at. It offers an exceptional user experience that your guests and bidders will love. · Frequent (but not too frequent) pop-ups and alerts make sure bidders know how close they are to winning their prize items. · Easy and quick registration that gets bidders into the heart of the action -fast. · The new information page provides guests and bidders with all they need to know about your story and why their donations and support are critical. · Live Screen connectivity that draws a crowd! 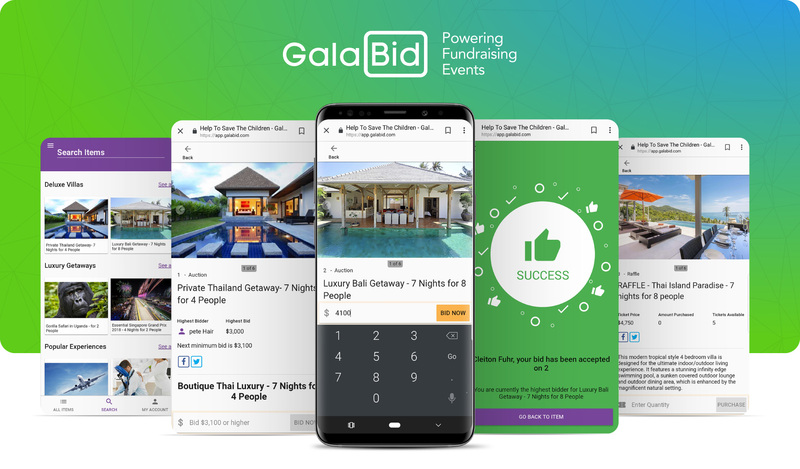 If mobile devices are tucked away in pockets or bags, our dynamic big screen action shows all the bid activity to keep guests engaged and the bids rolling. More! More funds. More fun. More connections. Our new platform is designed to help your cause go further. While raising money is paramount, our engaging user experience means your guests will give your fundraiser great word-of-mouth which also means more goodwill, supporters and donors. We’d love to help you. Get in touch here to find out more.